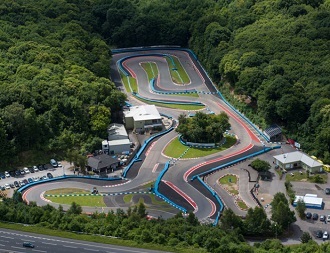 In the North Kent downs, surrounded by picturesque woodland, lies the beating heart of British karting and following the recent redevelopment by the late John Surtees CBE, it is one of the most stunning motorsport locations in the United Kingdom. Buckmore Park has been making pulses race for over fifty years. Since its launch in 1963 it has become the breeding ground for many young drivers eager to cut their teeth before moving on to different types of motorsport. This includes the 2009 F1 World Champion Jenson Button and Triple F1 World Champion Lewis Hamilton. But aside from being a fantastic race circuit Buckmore has something to offer everyone; no experience necessary. Whether it’s for that first taste of motorsport or just another box checked on the bucket list, thousands of adults and children flood to the circuit each year to experience the twists, turns and adrenaline rush of driving on hallowed tarmac. Buckmore offers karting for ages 4 years and above with seven different fleets of karts to suit different age groups. There are full conference facilities and on-site catering available. The circuit itself is located less than 45 minutes from central London; making this the ideal venue to play host to a fantastic corporate or team building day. Please note - Corporate Group prices are shown exclusive of V.A.T. An adult-only exclusive event: 5-minutes qualifying to determine your grid position then a non-stop 30-minute race. An adult-only event: 10-minutes qualifying to determine your grid position then a non-stop 45-minute race. An adult-only event: 10-minutes qualifying to determine your grid position then a non-stop 60-minute race. An exclusive team endurance event. Qualifying to determine your grid position then a non-stop 90-minute relay event for teams of 3 drivers sharing a kart. An exclusive two-hour team endurance event. Qualifying to determine your grid position then a non-stop 120-minute relay event for teams of 2 to 4 drivers sharing a kart. Exclusive kids party package for 6 drivers on the National circuit driving junior petrol karts (£40.00 per additional driver up to a max of 10). Each driver will receive 30-minutes of driving time. Exclusive kids party package for 6 drivers on the Club Circuit using 20mph petrol karts (£40.00 per additional driver up to10). Each driver will receive 30-minutes driving time. A huge range of events and activities are available at this venue for corporate groups of any size. Laser tag, quad biking and power turn karts can be included in a go karting package, and full use of the modern conference and catering facilities can be provided for parties and events. A range of go karting event options are available at this venue and extras, such as catering, can be included to make his last day of freedom a truly memorable experience. These do have roll cages and/or safety belts. There is a separate cadet/junior circuit. There are twin-seater karts for demo rides. There are showers on site. There is a kart/spares shop on site.